No boring chicken here. Not with this amazing sauce. Did I mentions it is amazing! Like addicting-ly good. Sweet, pungent and lightly spicy all in perfect harmony. 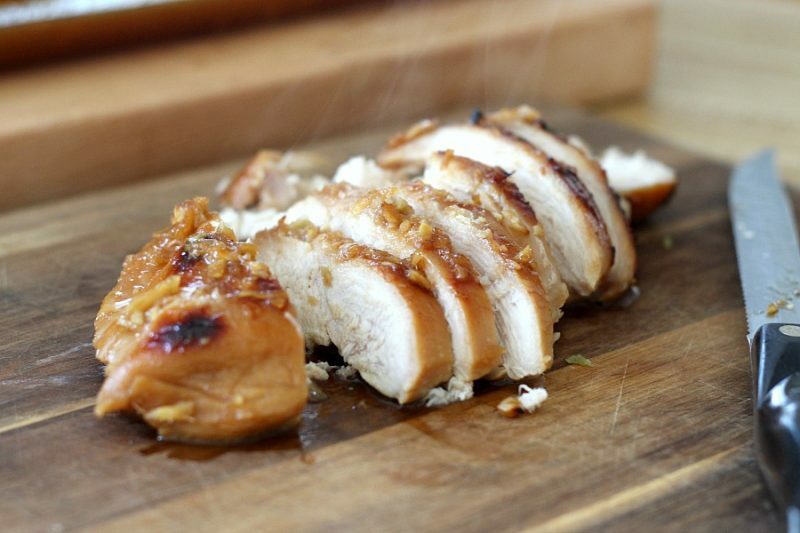 Indonesian ginger chicken is an easy recipe that begins with a simple marinade. Then it is baked. 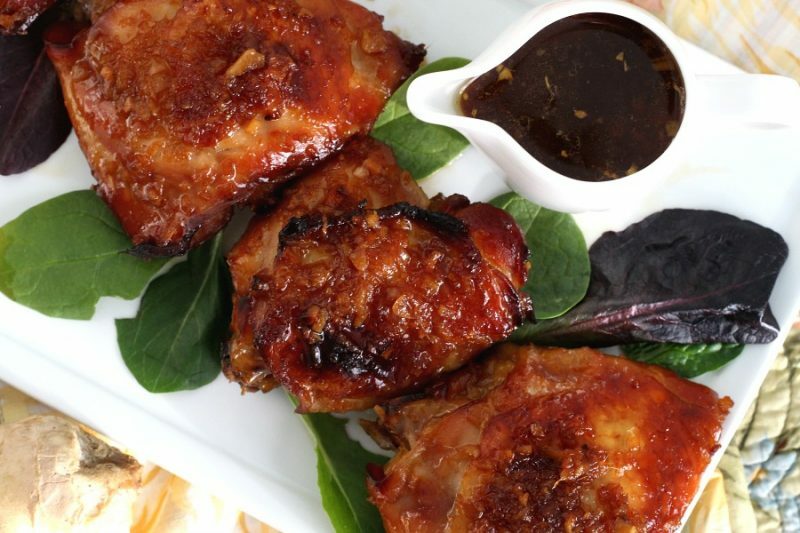 The result is moist and flavorful chicken with a lick-your-fingers delicious sticky exterior. Dark meat or chicken breasts? Do you have a preference? It is all the white meat from the chicken breast around here but I know dark meat can be cooked longer without drying out. I made the recipe twice. 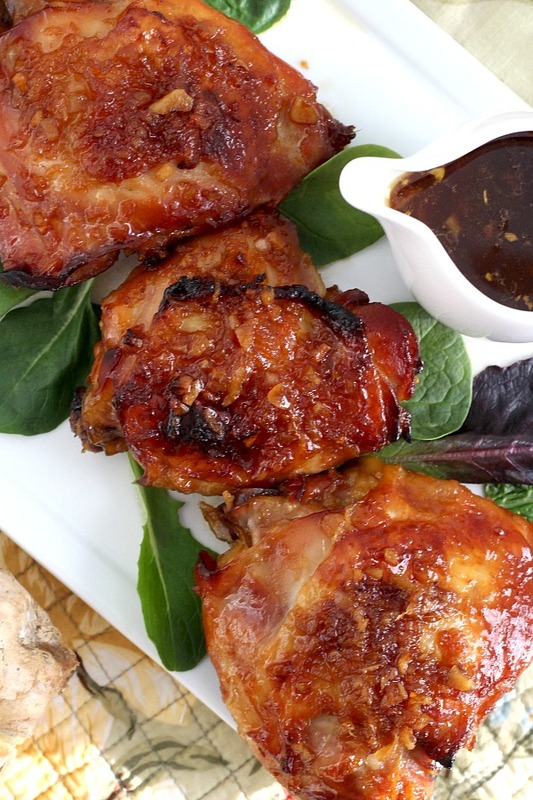 Once with bone-in chicken thighs and once with boneless, skinless chicken breasts. The original recipe calls for 2 whole chickens, quartered, with backs removed. Obviously using a whole chicken will give you both white and dark meat. That might work out perfectly for you. It also suggests leaving the skin on, another change I made. I cut away almost all of the skin leaving just a piece large enough to cover to top of the thigh. Combine with the honey and soy sauce. Pour the marinade over the chicken (skin side down), cover with foil and refrigerate over night. 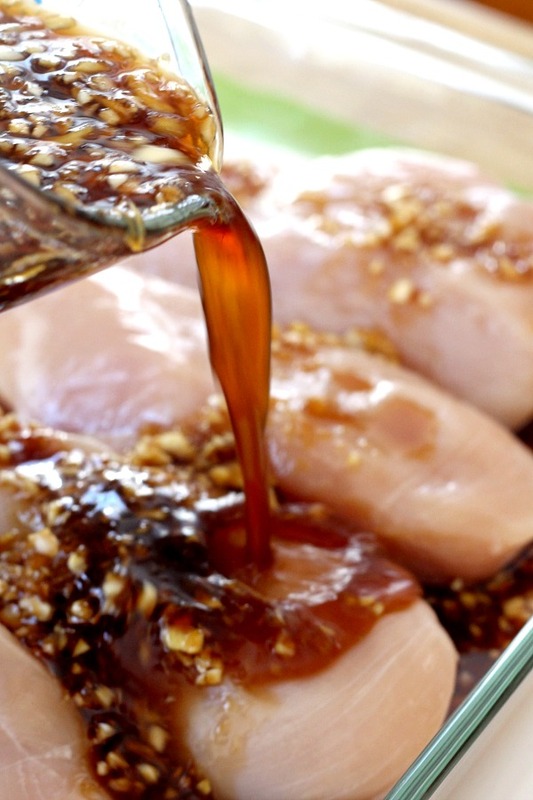 Prepare the marinade as above and pour over the chicken breasts. Cover with foil and marinate overnight. Bake chicken covered then remove the foil and continue baking until cooked through. As you can see, the chicken came out tender and moist but with less of the ginger sauce clinging to it than the chicken thighs. Serve the sauce on the side. It is delicious on the rice too! 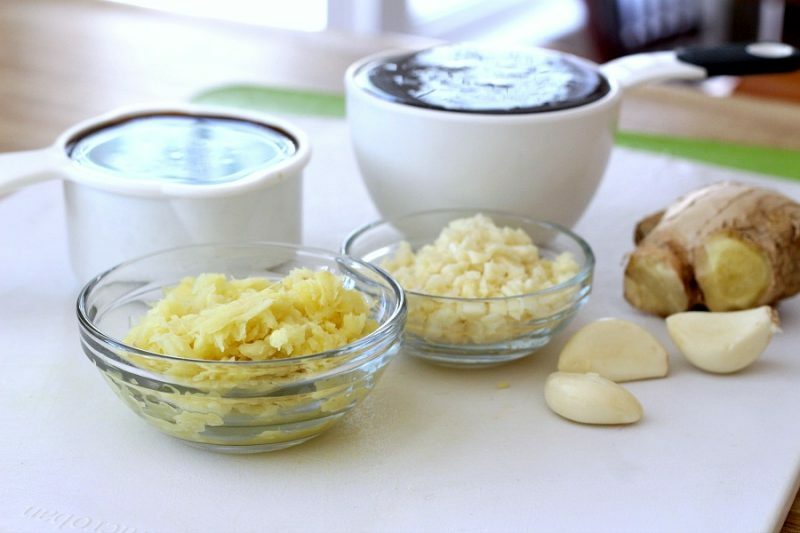 Stir together the honey, soy sauce, garlic, and ginger root in a small saucepan until completely combined. If needed, heat over low heat until the honey is melted but I don’t find this is necessary. Arrange the chicken in a layer in a shallow baking pan, skin side down, and pour on the sauce. Cover the pan tightly with aluminum foil. Marinate overnight or for at least 4-5 hours in the refrigerator. The thighs cooked for a longer time and therefore the sauce thickened a little more and coated the chicken better. The meat was tender and moist and really delicious. Removing the extra skin worked out fine and probably reduced the fat content in the sauce. The chicken breasts needed only 15 minutes baking after the removal of the foil. The chicken was very good especially with the pan juices poured on top. I like the way the breast slice and I much prefer the white meat over the thighs. If you like to cook, bake and entertain as much as I do, I think you will like this guide for Celebrating Mother’s Day. 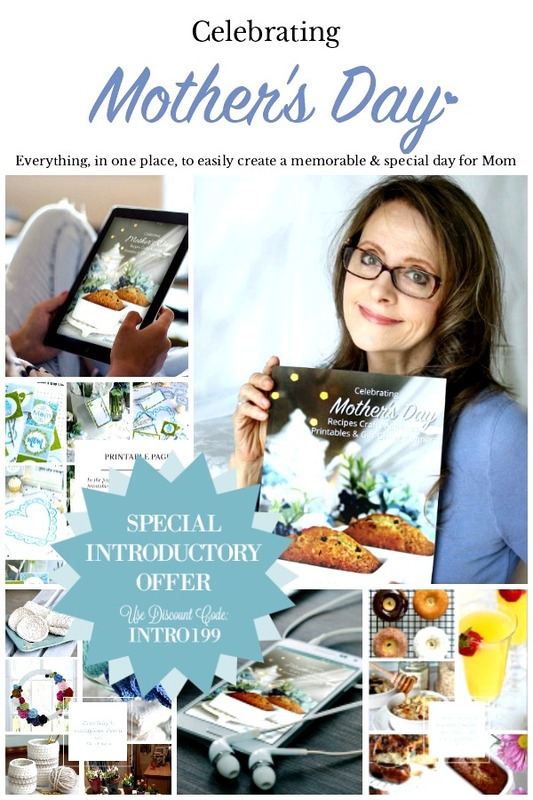 And, right now, just in time for Mother’s Day, you can get the PDF version at a Special Introductory Price. But, don’t wait! This offer is for a limited time only! I have tried your ginger chicken but it didnt come out so well. It was salt and the chicken was dark. I use 9 pieces of chicken and i follow the recipe. I am sorry the chicken did not turn out as you had hoped. Did you use the low sodium soy sauce as suggested in the recipe? The soy sauce will also darken the chicken. 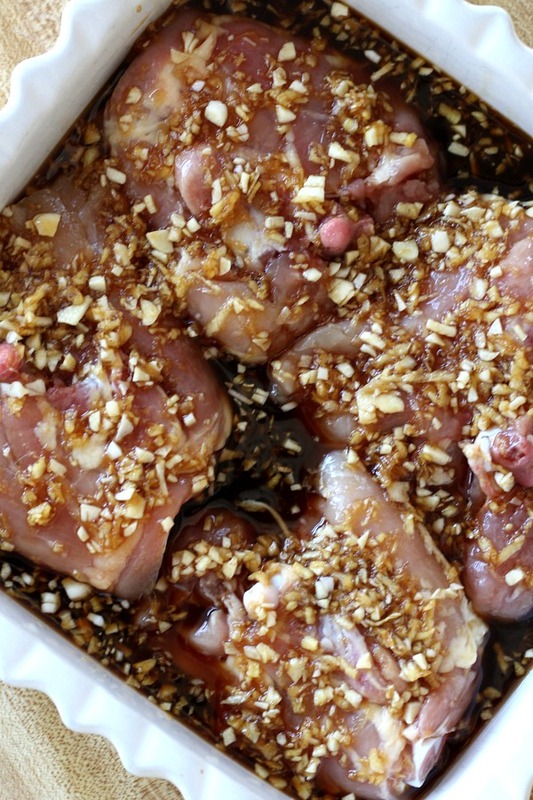 Do you bake the chicken in the marinade ? Yes, you do bake the chicken in the marinade. 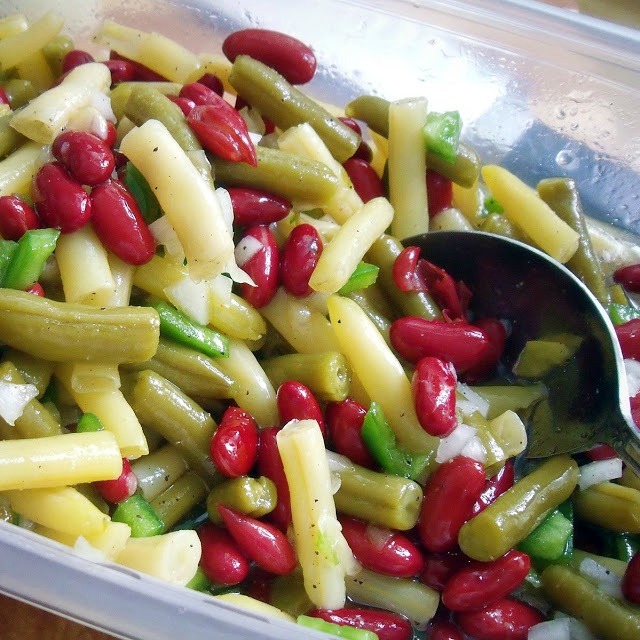 Take the dish out of the fridge after marinating and bake as is with the foil on according to the instructions. Once the chicken is done, pour off the juices (marinade) into a gravy boat to use as a sauce over the chicken. Enjoy! Can you use ground ginger and if so how much would I use? It sounds good and it looks very easy to make. Thank you for the recipe. 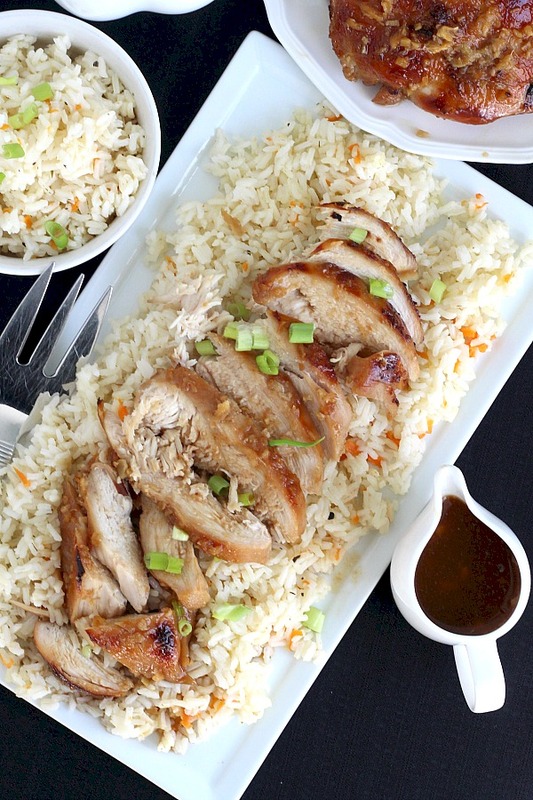 This looks delish and I am absolutely going to make it but the rice looks delish as well and I was wondering if you could give the recipe for that?? Thanks for stopping by and leaving your comment on the Indonesian Chicken post. Nothing special about the rice. I just follow the instructions on the bag and toss in a few shakes of herbs and a little butter in the water. After the rice is finished cooking I often stir in some frozen peas just because we love them. Looking at the photo, I think I added just a little grated carrot. It doesn’t add much flavor but it does add color. Can I marinade ina ziplock ? What can I use as a thickening agent to actually coat the chicken, so it will form an real glaze on the meat during cooking ? Yes, you can marinate the chicken in a ziplock bag and then transfer it to a baking pan when ready to bake. I’m not sure about using a thickener. The marinade thickens over the meat as it bakes. As described in the recipe, this is best when using dark chicken pieces (thighs or legs) as they bake longer than the chicken breasts. How did your chicken turn out? When I made the recipe using skinless chicken breast, I added an additional 15 minutes after removing the foil (as described in the post). Of course the time depends on the size of the chicken so it might need a slight time adjustment. I watch closely because it can easily become dry with overcooking. As Indonesian myself I’ve tried your recipe and its soo yum! Only I’ve used Kecap Manis (Indonesian Sweet Soy Sauce) instead of honey. And add few kafir lime leaves. Mmmmmhhhh soo good! I make this recipe with grated orange zest and juice of one orange, lime works well also. What a great idea to make with citrus flavors! 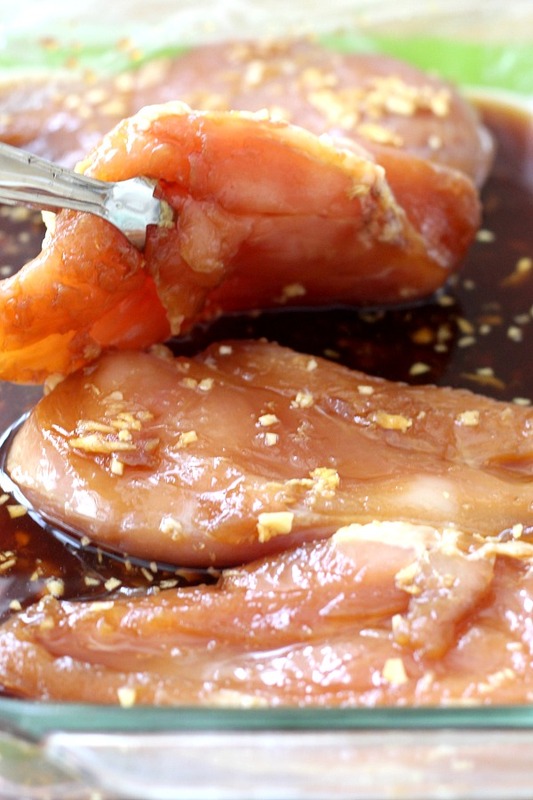 Do you just add the zest and juice to the marinade? How long can this stay marinating? 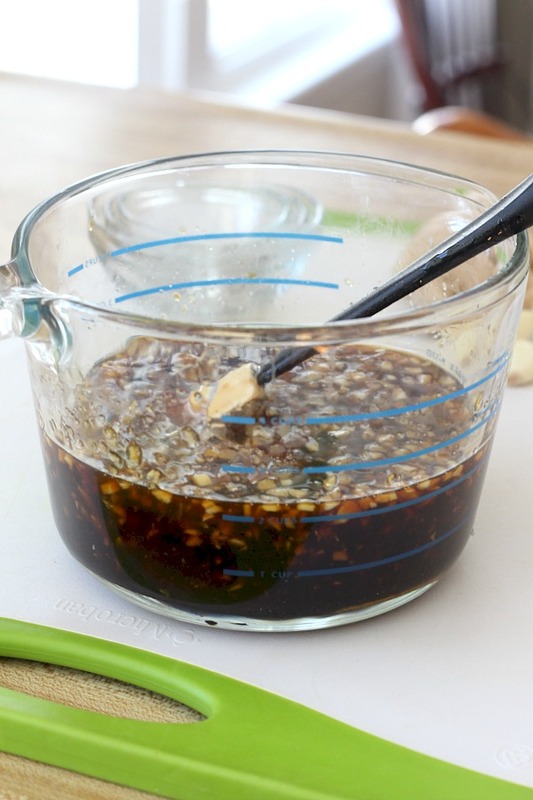 Can I marinate overnight and then not cook it until the following night? I think the chicken will be fine marinating overnight to be cooked the next evening. I wouldn’t go much longer than that as the texture of the chicken will be affected. Would like to try out your recipe. Will you please tell me which soy sauce to use? The sweet one or the salty one? I prefer low sodium soy sauce in this recipe. Looking forward to hearing how it works out for you! Let me know. This is the best chicken ever but to be honest when mom made this I literally poured that left over sauce on everything I could find to put it on!!!!! It was phenomenal!!! Oh my goodness but this sounds wonderful! 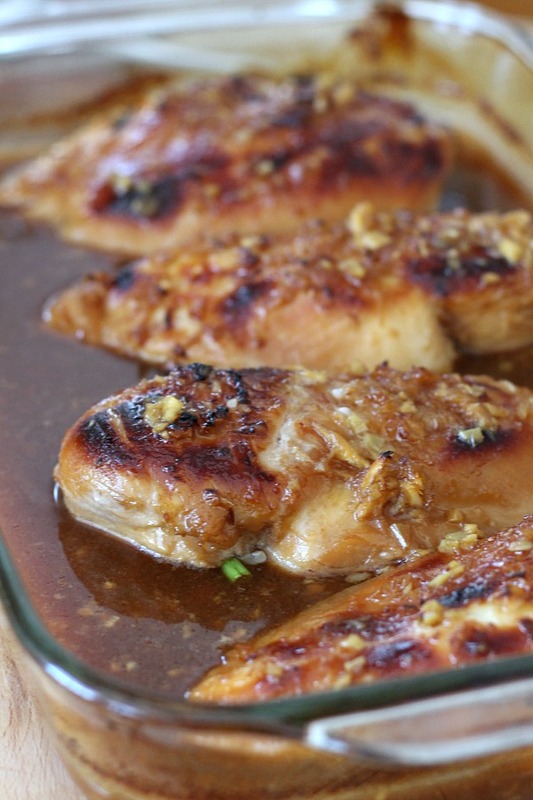 I love a similar recipe for Fig Rosemary Chicken so I will try this one. Thank you! Lorraine- That sounds delicious and I am drooling over your pictures. It is hard to take good ‘foodie’ pictures and you do a great job. I can almost smell the recipes you post. This sounds like a very flavorful meal!